Contrary to the case interview, I don’t recommend to pause for 60 seconds at the beginning of your McKinsey PEI to structure your story. Looking at the overall time frame of roughly 12-15 minutes for the whole Personal Experience Interview, 60 seconds is already quite some time. And during this time, your interview would be probably bored, watching you thinking in silence about your PEI story. Also, the whole McKinsey interview procedure is clear and transparent, and you also know that you need to prepare PEI stories for the 3 dimensions Leadership, Personal Impact and Entrepreneurial Drive. In other words: you should prepare your PEI stories upfront. Therefore, as an McKinsey interviewer also I expect a rather quick answer to my starting question. It’s perfectly fine though to pause for a few seconds before you start off with your Personal Experience Interview example. Especially if the interviewer asks a starting question with a slight spin, so that you need to frame your example accordingly first. 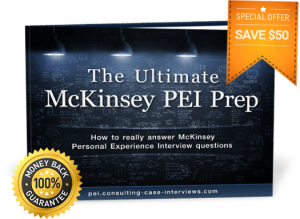 To really master your own McKinsey PEI, get your copy of The Ultimate McKinsey PEI Prep eBook right now!